Sunscraper Spire - next to last "switch" that needs a bomb before taking the trip to fight Luminous appears VERY problematic for the bomb to auto-detonate. Krypt King Skylander battling villain, and I went to take off the character. The game ignored that fact and my character was in play. I had a trap in play. I believe I had to take off the trap to finally "reset" things. On Chapter 7 Monster Marsh the Eye Screams dropping barrels along the gate after Headwick opens the path - skylanders using weapons appear not to work while traveling at an angle. I noticed it later in the level after the Eye Five boss fight as well. In short - skylander's capabilities appear to be non-working while moving on an incline. On Chapter 10 Secret Sewers of Supreme Stink Kaboom was in the Fire Element gate and went to get the key on the right hand side. The key would not follow him to the gate for unlocking, but when you returned to the original location of the key it started to follow him as long as you were on the top level. 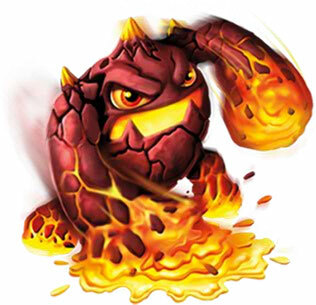 By exiting the elemental area, the key "suddenly" appeared next to the skylander, and I was able to return back and use the key. Special accomplishment "No Goo for you" for chapter 10 does not count goo coming from spouts or goo chompies. It appears to only count the goo on the floor. When accepting any villain quest where additional loading is required for you to play quest, the entire board is "reset" when you return...so if any keys were opened / not opened, villains fought etc in that area literally has to be done again. This has happened 100% of the time. More than likely a conscious design choice but want to call it out as this is very lazy and will cause re work by players. On Chapter 2 Know-It-All-Island, when trapping Buzzard Beak, the animation for moving into the trap froze and the game had to be reset. The save file got corrupted. Only one skylander was on the portal at the time. On Chapter 5 Chef Zeppelin, with Bushwack the frame rate dropped precipitously when fighting Bomb Shell for some reason. I've completed it several times and only happened on this one occurrence. Not happy with level design on a few levels where forked paths doesn't present clear information on which is battle versus other additional area that needs to be explored. In many cases, I pick the wrong path and I am forced to complete the level without the ability to return to the area. Note I am not talking about general areas where I know I won't be able to return. I've got so many glitches that I don't even keep track of unless they are really crazy like the one I got two nights ago. I was using Head Rush on my Xbox 360. On Chapter 13 - The Future of Skylands I was on the Anti-Grav Truck and it was grabbed by the large machine. I hit select to check her stats and when I returned to the play screen, the Anti-Grav Truck was gone. Poor Head Rush kept falling down into nothingness and respawning in mid air only to fall back down again. I had to select the level over again as there were no way out of this. I was playing level 11 Wilikin workshop, and I skipped the initial cutscene with Kaos and Flynn on the ship, and it skipped me to the boss battle w/ . Well, good news, my traps not corrupted. I know... much sadness, I only have my Nightmare save file left because of the glitch..
Im guessing u could only do this glitch while triggering the soda while in shadow mode. hot head broken too.. the brokenness list is endless... this is just sad. I was playing through Phoenix Sanctuary, and I put Krypt King on the portal. In his magic moment animation, he had no sword. Then when I was playing as him, I could use the sword attack but his sword wouldn't appear. When I got back to the hub, his sword still wasn't there.... Until a few seconds later, it magically reappeared. Never had specifically that,but sometimes using him or Sonic Boom would make no one say their catchphrases when they entered the portal for a bit. It eventually fixes itself,but it still scares a little. My glitch videos merged with this official topic + sticked! Activision make a patch to fix all these glitch! Can't believe I'm the only one in the forums that lacks the patience enough and runs into the glitch. Remember kids, not waiting for the game to load is no good. Bug: Go to the Select Menu as the screen transitions from the minigame to the hub(while the screen is fading to black,not sure about other moments); you'll cancel the map change and end up in a very glitchy version of the Skaletones area. If you want even more craziness, walk past the darkened area, and you'll find yourself in Skyblock Limbo. Video: 9 seconds in this LP episode from my series. I actually recorded a ton more but it was mostly the game throwing me out of bounds. Sorry for the quality(voice quality included). It can be fixed by going to a level and then back to the hub,or leaving the save and then going back, but yeah I'm very thankful this game doesn't save your position. So, you hit select after you select a character to play Skaletones with to cancel from the game? Not sure exactly where you hit select. Interesting glitch. I'm sure there's many more of these things. Gusto and Boomer (co-op) trying to play the last level of the first set of arenas (the bird nest). Crashed repeatedly until I gave up and did a different arena battle, which worked fine. After you go back from the game to the hub, in the fade to black between them. It's way harder to find than 'fall from high enough to go through the floor' in Sonic Boom RoL, but the flashbacks to it are still there. When I was playing Chapter 4 (Phoenix Psanctuary) on the Wii, two Shreadnaughts started fighting each other. They kept on going near each other, but they didn't deal any damage to each other and I was able to kill them easily. Another glitch I encountered was in Chapter 6 (Rainfish Rivera), and no attacks on the ground would show up. It basically meant that I couldn't see Bomb Shell's flames that he leaves behind and I couldn't see Tuff Luck's clover patches. On both glitches, they were the first time they have ever happened. I need some help! Been playing on the XB1 since launch, trying to get the kids to finish the game. Yesterday when they were trapping some new characters, the voices did not come thru the portal speaker once trapped. My kids were totally bummed because they like to hear what they say. Anyway, I completely exited the game, hard rebooted the XB1 and had them play another level. Trap another guy, no voice thru the portal!! I was also trying to find a way to 'ping' them to get them to talk, is this possible at all? My portal sat on the carpet for a long time and not sure if static electricity got to it, but it still lights up and reads all the characters fine..
Silly question, but there is a portal volume control in the game settings. I've forgotten that I've turned off the portal volume for evening playing, only to be surprised when I don't hear anything from the portal. Have you checked there to see if the volume for the portal is all the way down? This is inside the game, not something on the portal itself. ^ah yes, this was it, had never even been into the settings, must have been one of them LOL, thanks! anyone else think gold is stupid? Dunno if this one's been listed, but in the Phoenix Psanctuary (PS4), the game locked up shortly after beating Chill Bill. When reloading the game later I was informed my game was corrupted, and lost my save data! Fear not the dark, my friend, and let the feast begin. My son and I experienced a corruption on that level as well due to a game lock...we were catching Buzzer Beak. There is one comment in a separate about a fix being made recently available. Can anyone confirm they received a recent fix, and "if so" what did that fix address...OR break? Just don't do that glitch with lightning rod - it's all kinds of wrong. BTW I found a SUPER GODLY DOOOOOOOM GLITCH! With Blackout you can get infinite health I'll post a tutorial! Wow, that will make him a god in nightmare mode! So true TTD...lol And that sounds cool Buuzer...can't to see the video. Anyway to repair that bug?? Is this a certain statue or all of them? what do you mean by "reset wii"? the problem u stated doesn't make sense. We're not there, so be as descriptive as possible, using complete sentences. It's failing to spawn,so unless you got a corrupted save restarting the game again or moving to another save should be fine. Never had an issue with the Skaletones statues themselves but sometimes they'd pop in when I used the teleporter to the main hall too much. Before an Auto-Cutscene use the "Cloud Gravity" power from the "Prince of Darkness" path. The Auto-Cutscene will interrupts "Cloud Gravity" and you will be immortal! After you activate it the God Mode works for all levels (after you activate it you can change the level infinite times), even if you use a villain or fall out! WORKS IN NIGHTMARE MODE TOO! I just had the Chef Pepper Jack moonwalk glitch on Wii U last night while defeating Luminous in Sunscraper Spire. Glitch: when you enter the first door on Fish-Eyed Walk, hold down X to attack a Bomb Shell, it will then get up and not have it's weird helmet, use Wing Whip to get it to fly around the room aimlessly, exit the room to reverse this. Bug: the legendary pepper does not appear in the part of the level where it is meant to be. I don't know if anyone else posted this yet but was just wondering if anyone knew a way to fix this bug since I only need the legendary pepper in order to four star the level. Did you try checking around the entire secret area? I swore I had but I went back the next time and it was in the entirely opposite corner to the teleport pad. I checked the whole area, then I restarted the level to see if it had been something I had done and yet it was still missing. You need to jump off every area in that first location. It's there. Believe in the Pepper. ^Thats because it is...its a non In-Game Variant Trap....the In-Game Variant's have a "name".... i.e. "Red Hot" Tussle Sprout. It's just a repaint like Hallow's Eve Fright Rider....or the Blurples...ect ect.